Tickets for members go on sale Tuesday 6th November, while non-members can book from Tuesday 13th. Click here for more details. Just a short one today, to tell you all that tickets are now available for our Preview Screening at the Riverside Studios: http://www.riversidestudios.co.uk/cgi-bin/page.pl?l=1350056750. Hope to see you there! Graduating from a university film course in 2005 at the age of 21, Alex Barrett had an idea: he wanted to make a feature film. 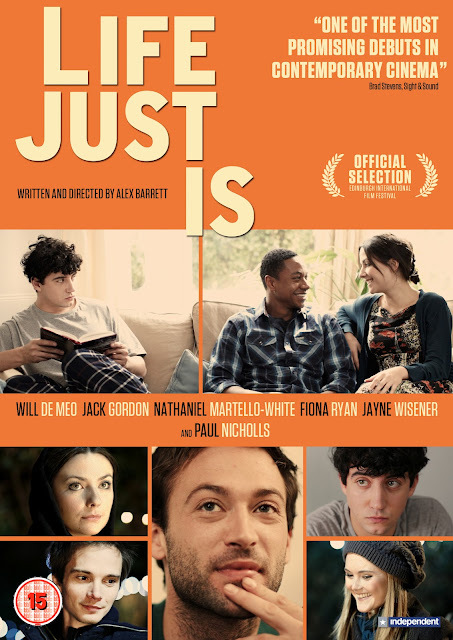 Flash forward seven years, and the idea has been realised as his debut feature LIFE JUST IS, nominated for the Michael Powell Award for Best British Film at the Edinburgh International Film Festival 2012. But how did a young graduate with no industry connections manage to get a film made, sold and distributed? And why did the process take so long? And what was the toll it took? LIFE JUST IS: DIRECTOR'S JOURNAL offers all these answers and more. Giving an unparalleled exploration of what it takes to get a debut microbudget film made, the journal presents a fascinating glimpse into the conception, development, production and postproduction of a film. Alongside its insight into the development of a film, LIFE JUST IS: DIRECTOR'S JOURNAL also builds a vivid picture of the development of an individual. Edited as it is from seven years of daily entries, Barrett's passions and frustrations are laid bare in full, while his honest, open and engrossing journal entries are filled with anecdotes, musings, reviews and thoughts which slowly build into a coherent philosophy of film and of life. Throughout the production of LIFE JUST IS, writer/director Alex Barrett has been documenting the process of the film's creation. 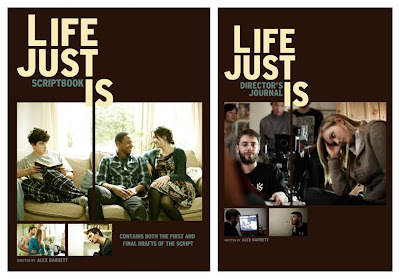 In keeping with this open exploration of the making of the film, LIFE JUST IS: SCRIPTBOOK presents not only the final draft of the script, but also the first draft, thereby offering a unique insight into the film's development. LIFE JUST IS tells the story of Pete, Tom, David, Claire and Jay, a tight-knit group of friends who share neighbouring flats in London after recently graduating from university. As they hang out, throw parties and navigate the new responsibilities of adult life, romantic tensions and existential crises begin to simmer beneath the surface. Further to our last update, it brings us great pleasure to give you more information about our UK release, and offer you the first glimpse of our DVD cover artwork. First up, we will be having a special preview of the film at the Riverside Studios on November 26th. This screening will be followed by a QA with writer/director Alex Barrett and actors Nathaniel Martello-White and Fiona Ryan. The film will then open theatrically on December 7th, with a two-week run in the Studio at the BFI Southbank, before being released on DVD and VOD on December 10th. Tickets for the theatrical screenings will go on sale in the coming weeks, and we'll post more details here as we have them. The DVD, meanwhile, will be available from all good retailers, and you can pre-order yours from Amazon right now by clicking on the picture or link below!